How can you make Christmas morning even more special for a child? With a personalized Thank You Letter from Santa Claus! 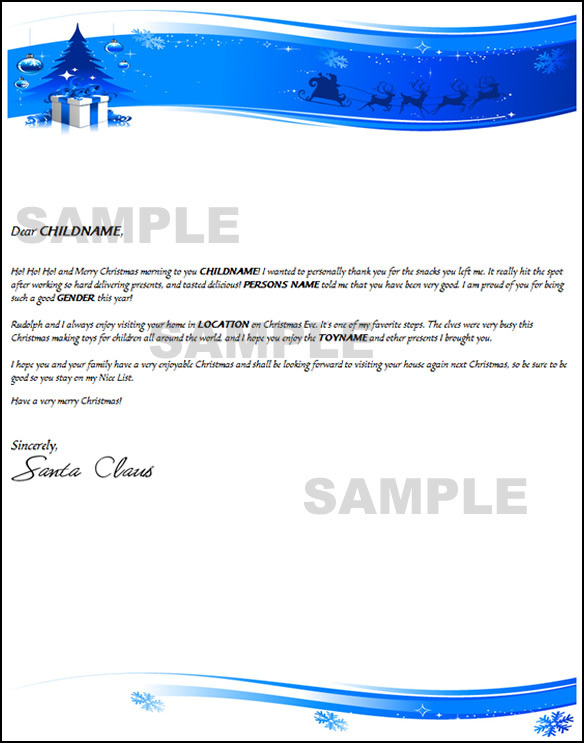 A SantaClausMailShop.com exclusive item, this personalized instant printable letter from Santa puts that extra special touch on Christmas morning for your child. Ideal for parents who leave out milk & cookies or other snacks for Santa, imagine your child's excitement on Christmas morning when they walk past the empty plate of snacks & drink left for Santa, to find a strategically placed thank you letter in it's place. 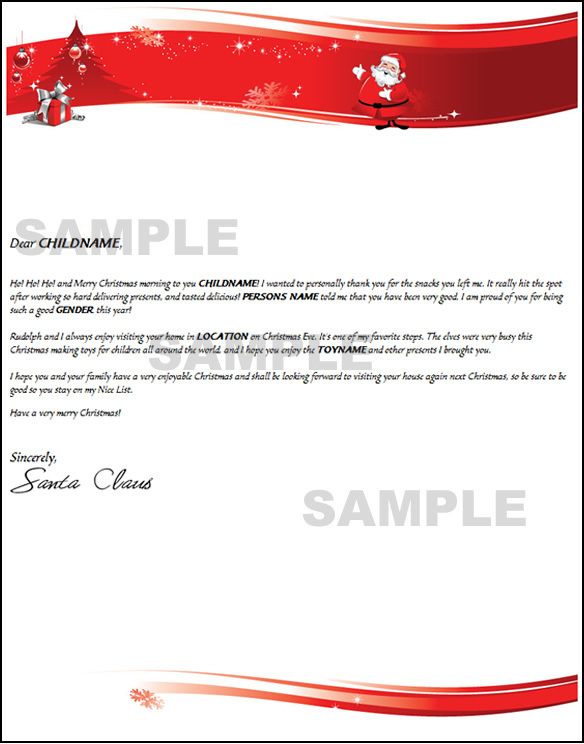 Our instant printable Santa thank you letters are a keepsake that will be treasured for years. Choose the letter style, personalize it, buy it, and print it online instantly. 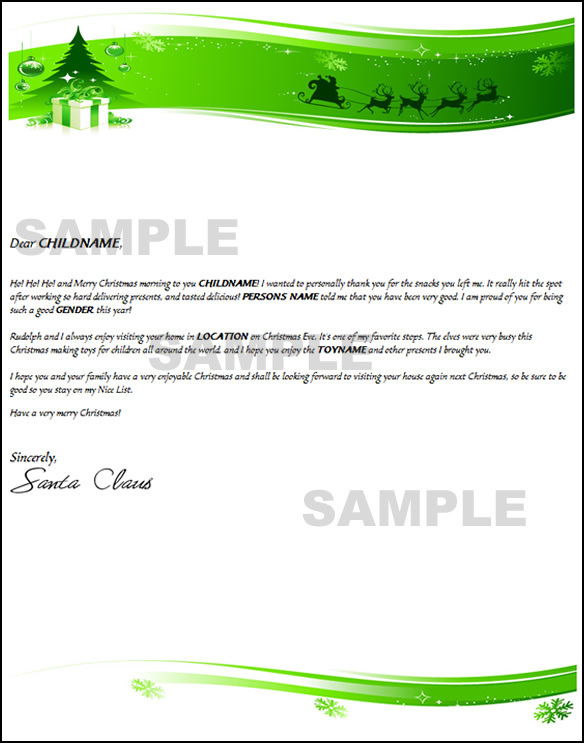 This Santa letter template includes fields for: your childs name, gender (boy or girl), location, parent / caregiver / teacher name, and name of at least one toy that "Santa" brought for your child this year. Click on a style of your choice below for a sample. Give a child a personal thank you from Santa for snacks - Beautiful blue Christmas header and footer graphics with presents and snowflakes. Give a child a personal thank you from Santa for snacks - Beautiful green pine Christmas header and footer graphics with presents and snowflakes. Give a child a personal thank you from Santa for snacks - Bright Christmas Red header & footer with a Christmas tree, presents, and snowflakes.